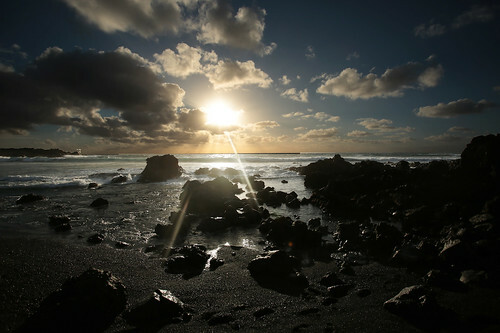 There are many things to see in Lanzarote, and many places have been created by nature: wind, lava and sea have created a view that leaves you breathless and catches everyone’s attention. I decided, today, to take you for a ride to some beaches and caves of Lanzarote: places that struck me, some more and others less (only one was a total disappointment). 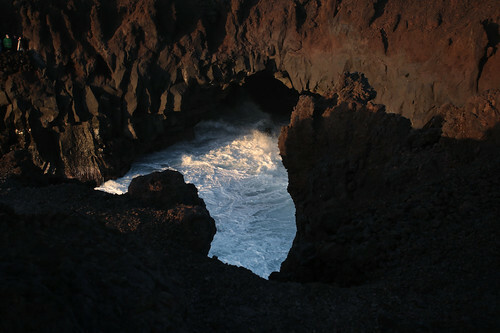 Let’s start from Los Hervideros, a series of caves where the sea breaks with a noise that, even after you’ve left, you remain in the head for some time. The best way to get there is with the car, and you will not have any problem to park it: there is always a little space for everyone in the parking lot, despite the crowd of tourists! Keep in mind only one thing: you may have serious problems taking pictures because of the strong wind, especially if like me you do not bring the tripod (or monopod) on the road. 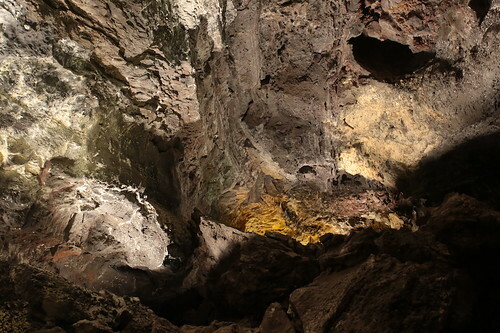 The second cave I’m talking about is the Jameos de Agua. 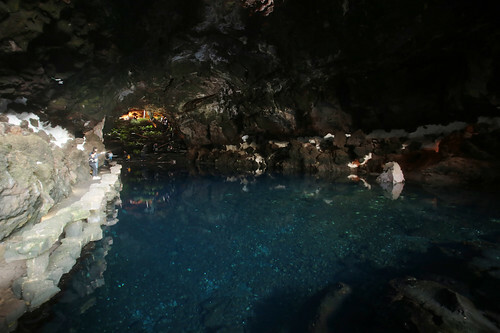 It is a natural cave in which there is a lake with intense blue water, inhabited by a species of white blind crabs. This place, unfortunately, has been a huge disappointment: the restaurant inside the cave and the outdoor pool have definitively ruined this site. It seems that once coins were thrown into the lake, but today it is strictly forbidden: the corrosion of the coins kills the crabs who live in its water. The entrance ticket costs 9 euros. A place that has proved to be nothing short of amazing is the Cueva de Los Verdes, born from the eruption of the volcano Monte Corona. The ticket costs 9 euros, and you can visit it only by a one-hour guided tour in Spanish and English. During the visit you cross a cave formed by two overlapping galleries: the corridors and labyrinths seem almost endless, and the lighting makes everything even more magical. A small historical parenthesis: during the period when piracy raged, thousands of inhabitants of Lanzarote came to take refuge here to hide from the pirates who were devastating the island. In one of the more extensive galleries, there is an auditorium that can accommodate up to a thousand people. At the end of the tour, there is a surprise that will leave you speechless, but I will not reveal anything to you (is too exciting and funny). We go out in the open air, now, because I take you to the Charco de los Clicos. It is a small saltwater lake with an emerald green colour located on a small beach with black pebbles. 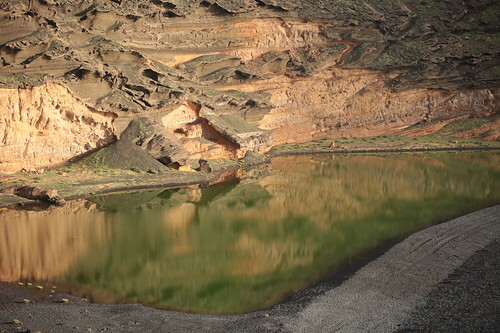 Its peculiarity is its colour, due to the contrast between the green water of the small lake, the black sand of the beach (from a distance, if not particular attention seems to be sand and not pebbles) and the lava rocks inlaid by the erosion, which creates almost a work of art. The lagoon is located inside what once was a crater of a volcano that, over time, collapsed. The emerald green colour is due to the plant organisms that have been able to thrive thanks to the mineral salts of volcanic origin. Naturally, given the particularity and the delicacy of the place it is not possible to go near to it or swim in the lake: to see it you must follow a pre-established path that takes tourists to a vantage point, from which you can observe the small lagoon and all that it surrounds it. photos. I conclude with the Playa de Famara. About 3 kilometres long, this is one of the most famous and popular beaches of Lanzarote and is renowned above all among sports lovers of surfing and kite-surfing: the windy weather condition make this corner of the ocean practically perfect for these types of sports. 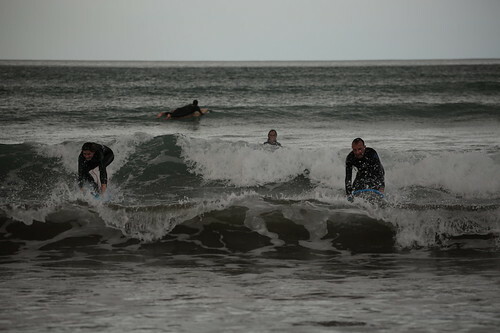 Many surfers take lessons, with the teacher who shouts them from the beach directions and suggestions on how to swim and what they need to improve on the next attempt. If you come here by car, you can park along the road between the beach and the dune area (where you can also take good pictures).